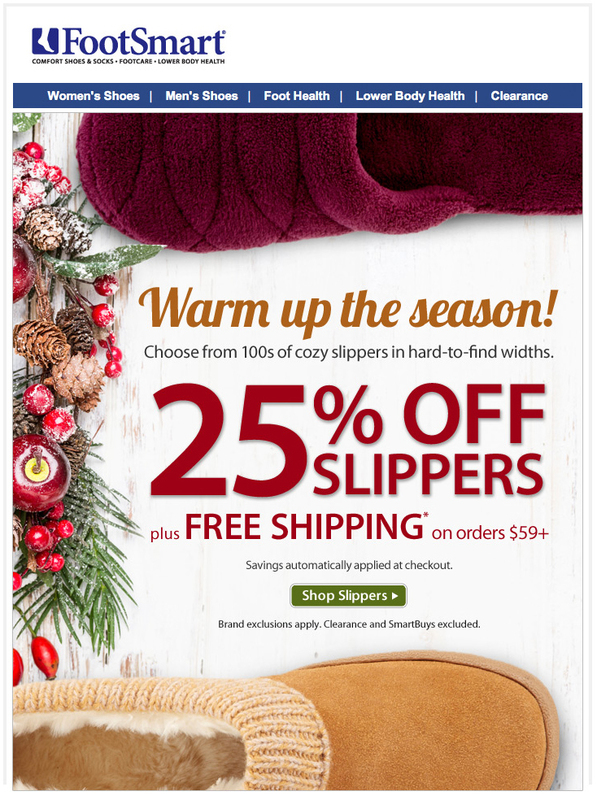 FootSmart needed an email that could be used to promote a deeper discount on slippers during the 2014 Holiday Season. The marketing team, however, did not want the email to feel overly promotional as customers were already being sent emails for Black Friday and Cyber Monday. The team wanted a holiday look and feel with a few featured products to help separate the email from the other text-heavy, promotional emails. For this email, I chose to create a scene that would entice customers to want to put on a pair of slippers. To keep with the holiday season, the color palette was kept in reds and greens with a touch of tan to also support the theme of warming up. Since marketing did not want the email to feel promotional, I chose to keep much of the offer copy inline so it could remain prominent but without feeling too dominant versus the usual method of stacking the offer vertically. Overall, the marketing team was very pleased with the look and feel of the email and felt it conveyed the promotion in a subtle yet still highly visible way. Portfolio Works by Michelle Ashman.